Exceptional drought, the most extreme category, indicates the most extreme conditions of drought and is considered to be a precursor to forced migration. 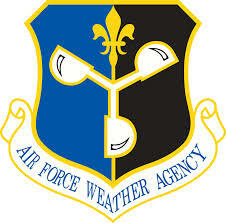 Since its first publication, “Owning the Weather 2025“, and “The Weather As a Force Multiplier“, both published in 1996, the Air Force has made it clear that it has thecapability to control the weather to the degree that their documents admit that they can weaponize both weather and earthquakes (see Exhibit 2 in the Appendix). Before you wrinkle your nose up and fall back on the phrase that so many have been conditioned by, “You must be a conspiracy theorist”, I have published the Air Force’s annotated bibliography on this subject of weather modification which is listed below in the Appendix(see Exhibit 1). I dare any reasonable person to read the data contained in the Appendix and not be able to conclude that the California drought , now in Arizona, now in New Mexico, now in Nevada and et al, in the Southwest, is not being artificially manipulated. I am going to stop short of saying this Air Force agency created the drought conditions. Although, a circumstantial case can be made that major political capital and money is at stake in the California drought. 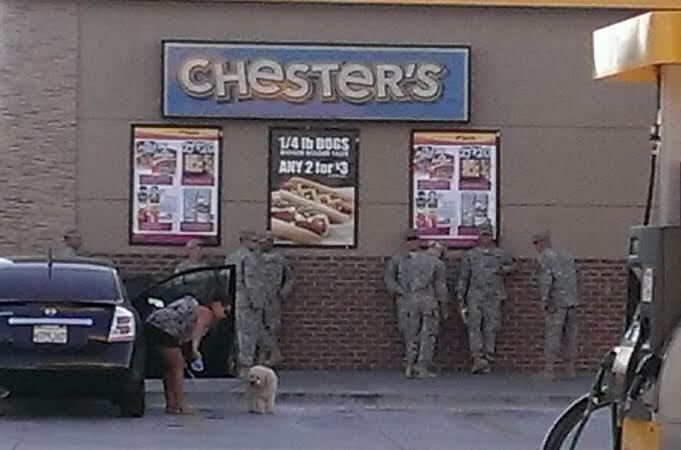 Further, the Air Force clearly has the ability to mitigate the situation. (see Exhibits 1,2,3 located in the Appendix). Additionally, don’t the citizens of California pay taxes to the federal government who in turn, oversees the Air Force? Then why aren’t the full resources of the Air Force Weather Agency being brought to bear in this crisis? Further, why isn’t a massive cloud seeding program being implemented in California’s mountains? I grew up in Colorado and when the ski season was delayed by late snowfalls, the state simply “seeded” the clouds to expedite the process. If this worked in Colorado in the 20th century, then why would it not work in California in the 21st century?The simple answer is because that is not the plan. Lynn Wilson from Kaplan University has stated that climate change is behind what is happening to California. Lynn Wilson has conducted no meaningful research in the area of climate change. In fact, Kaplan University has never published a research study on climate change! Then why is Wilson speaking out on this issue? Wilson’s and Kaplan’s lack of meaningful credentials in this area are puzzling that any media outlet would give them the time of day, until one considers that Kaplan, a for-profit university is owned by the globalist propaganda mouthpiece, The Washington Post. Amazingly, Lynne Wilson serves on the climtate change delegation in the United Nations. This fact makes Wilson’s statement that “Civilizations in the past have had to migrate out of areas of drought. We may have to migrate people out of California”, to be very suspect with regard to moving Americans out of California. Why is Wilson promoting the mass migration of Americans from California? More importantly, why would anyone listen to someone with no credentials to have the authority to make such a claim? Most importantly, why is Kaplan, which is basically an online university that does no research, being thrust into the forefront by such media outlets as CNBC? Lynn Wilson meet Peter Sutherland. I recently wrote about Peter Sutherland and pointed out that this Bilderberg Steering Committee member, former head of the Western Europe Trilateral Commission, the former head of the Bank of Ireland and the person I identified as the mastermind of the conspiracy related to the Gulf oil explosion, would be in charge of any population movements inside of the United states. Most significantly, in 2006, Peter Sutherland was appointed as the special representative (SRSG) on the United Nations International Migration and Development.The UN’s International Migration and Development would be in charge of large scale population movements. It is clear that Lynn Wilson is a convenient puppet and a bumbling mouthpiece for Sutherland. Over the past month, I have written about Sutherland being the point man resulting in th.... I am surprised that the propaganda aspect of these intentions is already in the mainstream media. My fear is that this plot is going to move very quickly. A more detailed synopsis about the threat posed to the United States by Sutherland can be obtained here. For those that are wondering why I am presenting the notion of climate change without a change, it is your turn. Climate Change is a term which evolved out of the term “global warming” which was debunked as a scientific concept as a result of the hacked emails discovery from East Anglia University in what became known as “Climategate” in which it was admitted that the scientists promoting the concept were cooking the books. Thus, “Climate Change” came into being. Now, man is responsible whenever there is a hail storm, snow storm, a tornado, etc. Any deviation in a “normal” weather pattern is due to man’s use of energy, particularly fossil fuels. Thus, the concept of Cap and Trade was born which would hand over all energy to a few enlightened men so that they could save the planet. 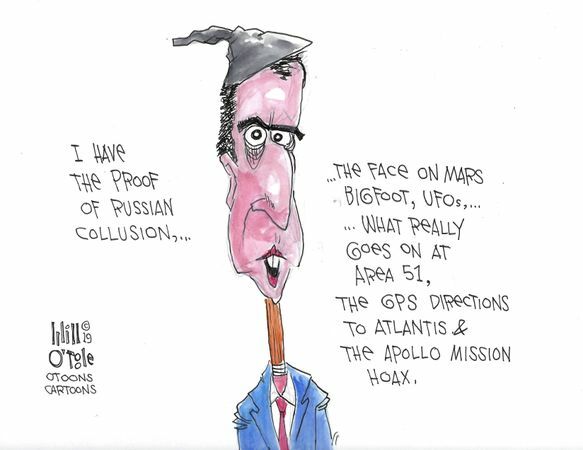 Forget save the planet, the science does not support the fraud. Handing over the world’s economy based on pseudo science is the goal. The present crisis in California helps to establish the public “legitimacy” of this goal and will serve to convince the people to give up their property, their rights and their fortunes in order to save the Earth. It will work because how many people in the general population know the difference between a control group and an experimental group? There is yet another reason connected to the evacuation of California at some point because of artificially caused drought. I previously written about the Atzlan concept as well as the role that MECHA and La Raza’s have proudly stated as their intent to establish a new country entitled Atzlan. The concept has been in formal existence for over a decade. It is based on the premise that in 1848 the United States illegally provoked the Mexican War which resulted in the loss of the present American Southwest from thecountry of Mexico. The historical allegations by MECHA and La Raza are correct. However, most reasonable Americans see the solution as being more unreasonable than the war which led to the loss of land in the first place. Atzlan advocates call for the expulsion of people of European descent from this seven state area. At one time, I saw this as a race-baiting divide and conquer strategy intended to create an unnecessary rift between whites and Latinos. Now, I see this in an entirely different light. This is the beginning of the breakup of the United States under the North American Union and the SPP agreement signed by President George W. Bush. If drought conditions can force evacuation under the auspices of the United Nations, the Atzlan concept could be a major step in the planned breakup by the United States by the United Nations. This would bring the United States closer in line to the following map which is also UN inspired. 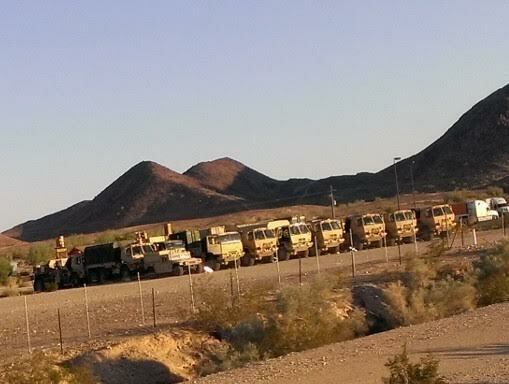 And the Jade Helm forces wil be on the street to enforce the exodous. 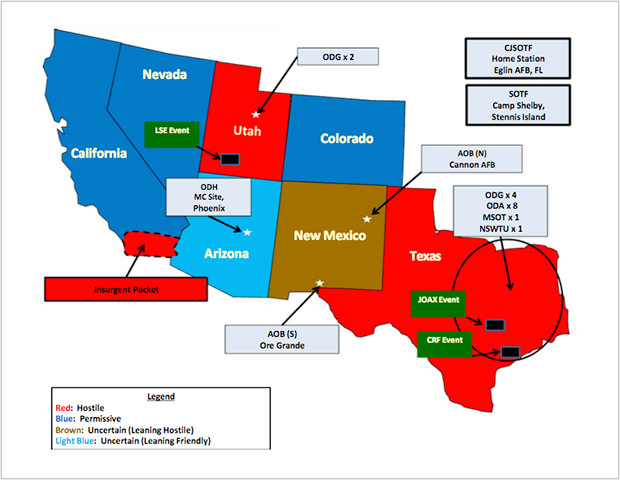 Only, it is not just going to be California that is going to be evacuated, it is very likely to be the entire Southwest; California is just the start! Repetitively, in my home state of Arizona, we are hearing the MSM rhetoric that we in Arizona are headed towards a California type of drought while completely ignorning Arizona’s massive water canal system known as the CAP. Colorado, Utah and Nevada are hearing similar rhetoric. The is the preconditioning of the people, through the corporate controlled. six-headed monster media. This seven state area is going to picked off one state at a time. Where will the UN’s Lynn Wilson and Peter Sutherland send displaced Californians? And is there any proof of this intention? 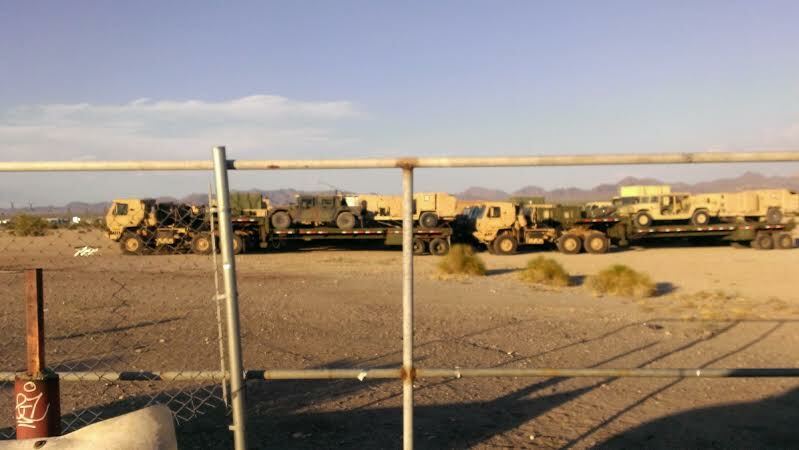 Please consider these recently published photos sent to me by an Arizona resident who lives near Quartzite in which we see a large military presence in the town. And where is Quartzite? It is on the Colorado River located at the border between Arizona and California. I am in possession of 18 documents which clearly demonstrate that the Air Force has known how to control the weather to a large extent for almost 2 decades. I have published 3 of the documents which are listed below in the Appendix. The weather patterns in California, which are contributing to the drought, are anomalous to say the least and the length of time that this have been going on defies all statistical probabilities. We have California coastal areas which seem to be operating outside the laws of the transpiration cycle. This can only be accomplished through the manipulation of the Jet Stream and the Jet Stream patterns have been unique. to say the least when it comes to California weather. The technology to do this is described in the various references in the Appendix (Exhibit 1; see also Dr. Nick Begich and his book “Angels Don’t’ Play This HAARP“). 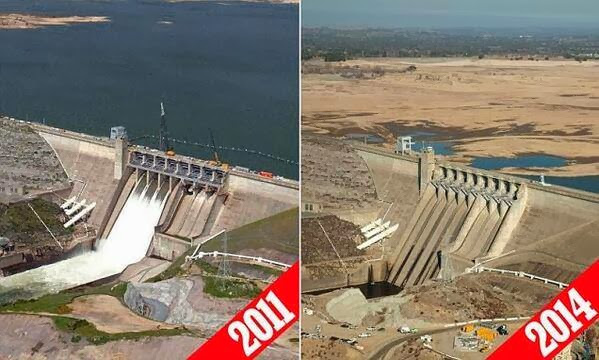 Certainly, the drought in California could bring together the long-term dream of the globalists to control all energy under Cap and trade laws. Further, California provides an estimated 40-50% of certain agricultural products for the nation as a whole. A lack of water could have a devastating effect on the economy with regard to food pricing. If one’s goal is the collapse of the economy as a means to destroy the United States, this would be an excellent covert plan. The presence of the UN on American soil is indeed troubling. However, California is just the beginning. To establish a New World Order, the globalists have to utterly destroy the main opposition which is our country. I submit that this process is already underway. Please take note that Deborah Tavares will be my special guest, on The Common Sense Show, this Sunday evening (6/21/15), from 8pm to 11pm (Eastern) and she will be shedding light on these issues and more. Agenda 21 in full mode here. This is the beginning. This government stopped the water over a fish. 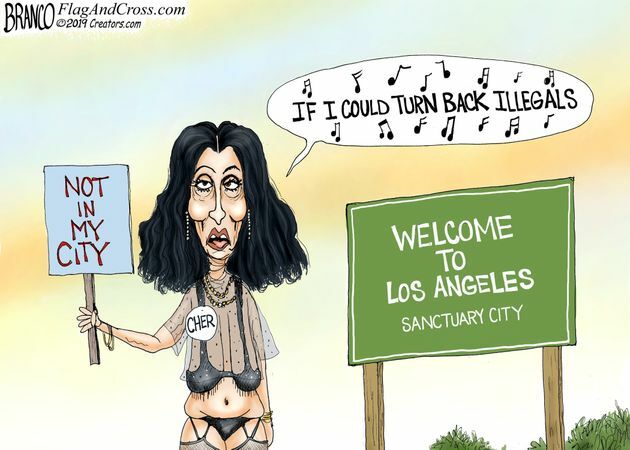 Get the damn government out of CA and fix the problem viola done. Control the weather that is something that this government will use to hurt the people not help them. This government is way to big and way to Nazi like to do anything good. YOU ARE RIGHT ABOUT THE WATER AND THE FISH !! ANOTHER THING TAKING WATER IS THE NSA IN UTAH FOR SPYING ON US !! WE NEED TO GET RID OF THE UN !! THERE CORRUPT AND ARE HELPING OBAMA PLUS THE GOVT.TO DESTROY AMERICA . HOW IN GODS NAME CAN THE UN DICTATE HOW WE AS A SOVEREIGN NATION IS RUN? WHO ARE THEY TO DO THIS? they will have to kill me because I WILL NOT migrate anywhere!!!!! God controls the weather and He will answer our prayers to punish the evildoers His Way. Sorry, but no one can control weather but God or He may allow Satan to do what he wishes as he is said to be the prince of the power of the air. YOU ARE CERTAINLY THE WIND. Another good reason for a full blown stand down of American citizens and to stop paying taxes. We need a full protest like Poland did with Lech Walesa. It is time the elites gpt theirs! 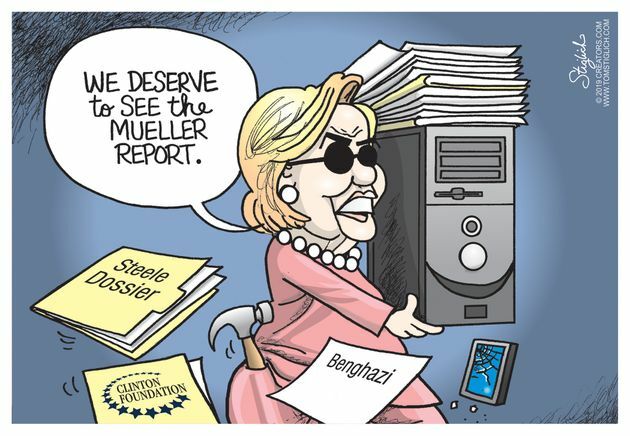 Evil to the core! The UN doesn't have the authority to move the rocks out of their own heads. SO SICK OF THIS BS!!!!!!! All I can say is that California brought it all on themselves... they voted in the liberal trash that made the decisions to prioritize the Delta Smelt over the citizenry... so be it. The get what they deserve. As for the UN trying to do anything in this Country, all I can say is, "Try it", oh and bring a lot of body bags. California is not part of USA anyway. They claim themselves to be part of the Pacific Rim. Maybe that is why the Gov pushed TPP & TPA. California has so many stupid people to put Nancy Pelosi, Barbara Boxer and Jerry Brown in charge.